When Mandy meets stuck-up Susan Collins she quickly decides that the only good thing about her is her pony Prince. But then Mandy realizes that Susan's determination to win at show-jumping threatens the life of the beautiful pony. Can she convince Susan before it's too late? i love foal in the fog its a heartbreaking story. a girls foal "curiosity" she got for her birthday she loved so much, the girl and her dad are taking the foal to the vet the girl gets bored because her dad was listening to the football game on the radio. she tells her dad to change the channel her dad gets distracted and go to the wrong side of the road they crash into a tree and the foal starts running they try to catch her but she is too fast. 2 days later the girl was still looking for her foal and she sees something there is a bog a hole where there is grass and you cannot see it and if you fall in you will be floating in water and its her foal the girl is so sad of her death. mandy is out riding one day in the fog she hears a car crash then sees a mysterious foal running up the road and disappears in the fog then mandy meets a girl who is haunted by her foal its up to mandy to help the girl and the foal. you make such great books. I love to read your books. 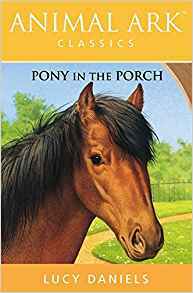 this book is about a lost pony on the porch and Mandy finds him but it is Susan Collins pony. and then Mandy realizes that Susan's determined to win at show jumping theations the life of a beautiful pony! can she convince Susan before it is too late? Shetland in the Shed is about a 7-year old girl who lost her mom due to an accident. The horse she was riding had a heart attack as it was jumping a very high jump. The girl blamed it on the horse. Her dad thought a pony would do the trick. On their way home, he had a wreck. Again the girl blamed it on the horse. While he is in the hospital, Mandy and her parents take care of her. And the pony, Shona. But the girl doesn't want anything to do with Shona. Can Mandy and James show her how beautiful and gentle Shona is? You'll have to read the book to find out what happens! Return to Share Your Favorite Horse Book Series!.